My first wish of 2010 has come true: seeing the exhibition of Sally Mann in The Hague. It took quite some planning and at times I was afraid I wasn’t going to make it, but at last I did! Immediate Family, Deep South, Faces of her Children, and Virginia. Immediate Family was the largest part of the exhibit and it was fantastic seeing the prints live. They were astonishing, probably as far as I could see on fiber based papers, but they looked very good. Technically well performed photos and prints. Always a joy looking at such things. Also nice to see the series displayed photos which are not shown in the book. That way you discover some new images. The Deep South series really impressed me. They consisted of landscapes with an ambiance that is very appealing to me; dark and mysterious. That’s exactly what I will be looking for when I take my wet plate stuff outside this summer. One plate surprised me as she had been scratching it up to make a specific area look darker when being printed. From a distance it looked as a cool pattern in the leaves, up close it looked really weird. I think these plates impressed me most. With the Virginia plates it was hard to tell whether they were plates or normal negatives. There was one misty unsharp photo which I really liked. That series did not contain many images though. I think there were about 3 of them. The faces of her children were at the back and I don’t like them. They’re vague, soft, no black, no contrast (which has the ability to work in an image but to me not here). So, it was more nice watching the flaws in the plates, of which there were many, looking at the borders and how it has been framed and such. That was interesting enough but the photos themselves were of no meaning to me, but that’s okay. I heard people comment on her “finishing touch” regarding the Collodion work. They found it a pity she printed them on regular gelatin papers and not staying on the alternative route. It does make the final work look a bit more common, although it certainly is not. And it would have been more cooler if she had been making and coating her own papers as it really does add to the final product. But, I am not really disappointed though, it’s the kind of gap others will fill up. The images are stunning, also like this. It’s not that the presentation is bad, I’ve seen worse, even by so called professional photographers. Some even go as far as saying it’s a way of making easy money regarding the gelatin prints…well…I think that is a harsh judgment, especially from another human being. She might have her reasons which are not known to the public, who knows? At the museum was also a little book store, I didn’t buy anything, I’ll give that privilege to a local book store where I live, but they had some nice Sally Mann books, a couple of which I hadn’t seen before, only heard of. One was “Still Time” and it contained a collection of different kinds of work of hers also some polaroids of 20×24. They were pretty cool (and big). Some platinum prints etc, I didn’t know she made that too. So, there’s more to investigate as always and I’ll be buying some more books soon I guess. After the exhibit we decided to go for a small stroll through the outer part of The Hague. It was pretty fun and cold. Lots of ice on the sidewalk, cool patterns in frozen water so I shot some film again which I hadn’t been doing in a while. After that we headed back to Maastricht and an end came to a great day! This entry was posted on January 4, 2010 by Contrastique. 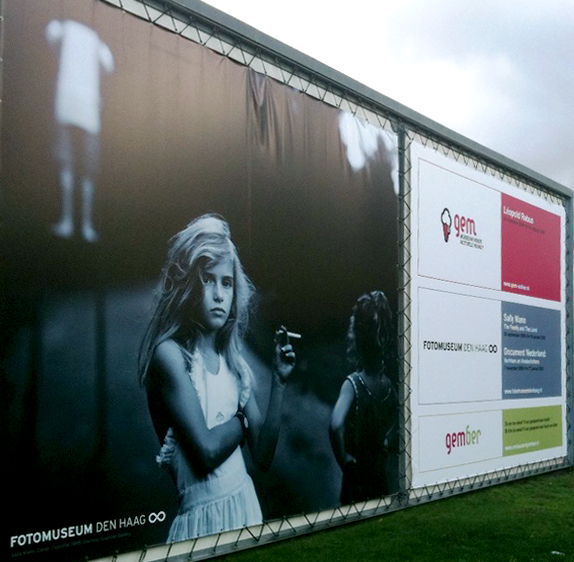 It was filed under Exhibitions & Demos and was tagged with exhibition, fotomuseum den haag, sally mann. Gah, you are so lucky! I would have loved to go see it. I just got “Proud flesh” for Christmas and I was kind of disappointed with most of the photographs in the book. I really want to pick up “Still Time” though; it looks really interesting. I am a fan of Polaroids, so it’d be nice to have. Yeah, I’m very happy I made it just in time. It would have been a pity as she’s not often around here. “Proud Flesh” is a book I’m more than interested in. Why did it disappoint you? “Still Time” looked really good indeed, the polaroids were great! Hope to pick that book up soon as well. Well, the plates were a mess; all of them looked exactly the same. There was not one clean plate in the book, and the subject matter was uninteresting. They were, for the most part, blurry and some were completely unintelligible as images. The best photo of the entire book is on the cover. I like the randomness that accompanies wet plate photography, but she revels in it to the point where the flaws of the plate overwhelm the subject of the photograph. If I knew nothing about her, I would have assumed it was someone just starting out in photography. I completely agree with that. I like the collodon flaws, it can add that little extra to an image. But when there’s nothing but flaws it looks like an amateuristic work. To each his or her own I suppose…too bad though as she has technique and the mind to make gorgeous images.